I love my people and I love my culture and, of course, my music -- I am what they call in Puerto Rico "un Cocolo." 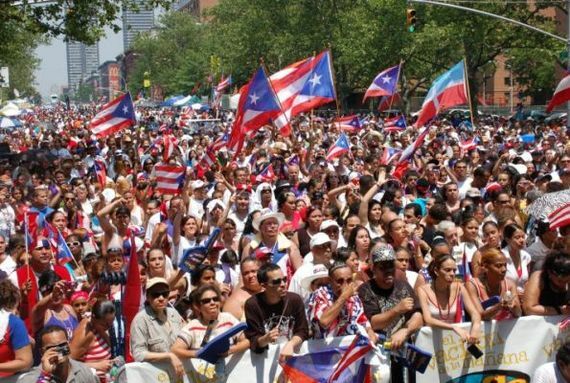 So going to the annual 116th Street Festival the day before the Puerto Rican parade is almost a right of passage for being Boricua -- you have to go there first. I remember back in the 1980s when Nick Lugo started organizing the festival and I participated as a vendor. Nick allowed us to have a table to promote my early days of Latino Sports promoting our hats and t-shirts. It was always fun and a great way to sell to our community. I remember telling Nick that one day his festival was going to be "our version of Calle Ocho," the well known and huge Latin music festival the Cuban community has every year in Miami's Calle Ocho. This past Saturday, I believe that the 116th St Festival reached that level, if not it has to be one of the largest Latino festivals in the country. I rode my bike down from the South Bronx (Boricua Mecca) since traffic and finding parking was going to be crazy. The number of people I saw celebrating their Puerto Rican pride was incredible. Starting up from 124th near the Taíno Towers you could already see the flags, hear the music and just about every block, community garden and corner down to 116th Street was celebrating. I know that every vendor selling Puerto Rican flags made out well. I witnessed so many people buying them that I saw one Mexican vendor-dropping dollar bills because he could not keep up with the volume. "Banderas a peso," was his selling pitch and they were selling like, "pan caliente." I personally stopped on 116th Street and walked across from Lexington to Third Avenue and that one block walk with my bike took me about 20 minutes. The number of people was numbing. The crowds were loud and sometimes chaotic, but not crazy. The police presence was everywhere and their numbers were obvious. They were there to prevent any crazy thing from jumping off. I never had a chance to walk to any of the stages to hear, or see any of the performances. It was almost impossible to walk anywhere. I spoke to three different ranking police officers (white shirts, gold badges) and each told me that there were about a million people in within the 12-block Lexington to Third Avenue radius. One million people -- now that is one hell of a number of people to mobilize to a festival! So I enjoyed the festival, the food, and the people watching. The beauty and pride that our community has is contagious as there were so many other nationalities with our flag and colors. One guy had a tee shirt that read: "I'm ½ Puerto Rican & That's better than None." I could only imagine how much more powerful our community would be if that massive economic, cultural wave of growing youngsters would wake up and use the technology at their disposal for education and empowerment instead of just for entertainment. The tweets and Facebook postings must have reached new levels as every young person I saw was holding on to their cell phone snapping away and many young ladies were posing for the instant gratification of a few seconds of fame. One huge party, Weepaa! I have seen the 116th Street festival grow in numbers, just as I have seen my community grow throughout the country. Unfortunately, numbers don't mean a thing. I have always said that our numbers alone are not going to empower us, or our future generations. Puerto Ricans continue to be at the bottom of the economic, health and educational levels of every other Latino population in the city. Yes, we have the most parades, the biggest festival, but we also have the population with the worst problems. And yet we have been here longer than other Latino communities and we are still the largest sector (by a slim margin). So what's wrong with this picture? Consider this, we still have the longest held political prisoner, Oscar López Rivera in prison now going on 33 years and counting for the non-violence offense of wanting Puerto Rico to be independent. He is our Nelson Mandela as he has now the distinction to be the longest held political prisoner in the planet. If we could get a tenth of those present in Saturday's festival, or Sunday's parade to sign a petition and volunteer just one day, or one hour to promote this cause we could get Oscar out by next year. Also consider this, we still have one of the greatest baseball players and humanitarians to play the game of baseball and his number is not yet retired throughout baseball. Why are their more places named after Roberto Clemente in the world than just about any other sports person, or dignitary? Yet we can't get the baseball Commissioner to retire that number? If only a tenth of those present Saturday, or Sunday would sign a petition and also dedicate just one hour to pass on the information his number would be retired with a year, or two. So while I enjoyed the beauty of our growing community, our 116th St. festival and the National Puerto Rican Day Parade I was also disappointed to see that we are not adequately using our potential. 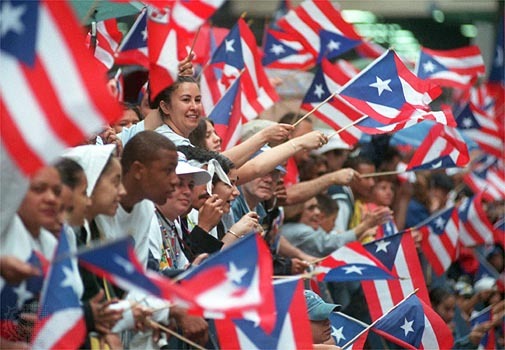 As proud as we can be to buy a $1 dollar flag and wave it for hours, we should also be proud to work to get Oscar Lopez Rivera out of jail and to get Roberto Clemente's #21 retired from all of baseball. Until then we will only be a community that knows how to wave flags for our pride.